CDM Publishing, LLC, D.B.A. 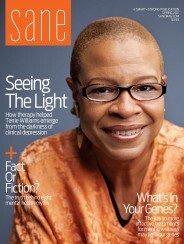 as Smart + Strong and Sane (“Smart + Strong” or “Sane”) operates the SaneMag.com Web site. The privacy of the users of SaneMag.com is important to Smart + Strong. Personally identifiable information will be used by Smart + Strong only as provided below or for the following purposes: to contact you; to fulfill your requests in connection with the Service or SaneMag.com, such as for products or services; to perform analyses of user behavior in order to measure customer interest in the various areas of SaneMag.com; or for such purposes as are described at the point of collection. Smart + Strong uses list services to send out information and change notices to users. While Smart + Strong only uses list services that it believes are responsible, it will not be liable for any breach of security or for any other action by such list services. Smart + Strong does not knowingly collect personally identifiable information from a child under the age of 13. Smart + Strong uses “cookies,” pieces of data stored on users’ hard drives for record keeping purposes. Cookies can make the SaneMag.com Web site and the Service more useful by storing information about the User’s preferences. CDM Publishing, LLC, D.B.A. as Smart + Strong and Sane (“Smart + Strong” or “Sane”) operates the SaneMag.com Web site, generally acts as the data controller of your information submitted through our website. If you are situated in the EU and have any complaints regarding our privacy practices as data controller, you have the right to make a complaint at any time to your local Supervisory Authority. We would, however, appreciate the chance to deal with your concerns before you approach your Supervisory Authority so please contact us in the first instance. Please see our contact details below in the section titled “Contact Us”. If you are situated in the EU and have a complaint, please contact us at website@SaneMag.com. Legitimate Interest means the interest of our business in conducting and managing our business to enable us to give you the best service/product and the best and most secure experience. We make sure we consider and balance any potential impact on you (both positive and negative) and your rights before we process your personal data for our legitimate interests. We do not use your personal data for activities where our interests are overridden by the impact on you (unless we have your consent or are otherwise required or permitted to by law). You can obtain further information about how we assess our legitimate interests against any potential impact on you in respect of specific activities by contacting us at website@SaneMag.com. We will only use your personal data for the purposes for which we collected it, unless we reasonably consider that we need to use it for another reason and that reason is compatible with the original purpose. If you wish to get an explanation as to how the processing for the new purpose is compatible with the original purpose, please contact us at website@SaneMag.com. If we need to use your personal data for an unrelated purpose, we will notify you and we will explain the legal basis that allows us to do so. Please note that we may process your personal data without your knowledge or consent, in compliance with the above rules, where this is required or permitted by law. If we are relying on your consent to process your personal data, you have the right to withdraw your consent at any time. You have the right to withdraw your consent at any time by contacting us at website@SaneMag.com. To exercise your rights, please contact us at website@SaneMag.com. To opt-out of any future promotional messages from us, you should send an unsubscribe request to us at website@SaneMag.com. If you do not want your personal information or personal data shared with any third party who may use such information for direct marketing purposes, then you may opt-out of such disclosures by sending an email to website@SaneMag.com. We will process your request within a reasonable time after receipt. Please note that if you opt out in this manner, certain aspects of the Website may no longer be available to you. If you are a California resident this section applies to you. Under California Law, California residents have the right to request in writing from businesses with whom they have an established business relationship, (a) a list of the categories of personally identifiable information, such as name, email address and mailing address and the type of services provided to the customer that a business has disclosed to third parties (including affiliates that are separate legal entities) during the immediately preceding calendar year for the third parties’ direct marketing purposes and (b) the names and addresses of all such third parties. To request the above information, please contact us at website@SaneMag.com. If you do not want your personally identifying information shared with any third party who may use such information for direct marketing purposes, then you may opt out of such disclosures by sending an email to us at website@SaneMag.com.